Expand your refrigeration options with this Delfield GUR27BP-S 27" worktop refrigerator with backsplash! This unit is a great way to provide out of the way, refrigerated food storage when space is a limiting factor. The 36" high working surface gives you extra space to prepare ingredients while the durable 4" backsplash helps protect the wall behind the unit and prevents items from falling off the back. Inside, the refrigerator comes with 2 epoxy coated wire shelves that offer you optimal storage. This model also makes unloading and loading product a breeze. The door hinge is designed to close automatically up to 90 degrees, or stay open past 90 degrees. Equipped with a 1/5 hp compressor and running on R290 refrigerant with an Ozone Depletion Potential of 0 and Global Warming Potential of 3, this refrigerator keeps your items cool between 36-40 degrees Fahrenheit. The high density foamed-in-place polyurethane insulation and door gasket also conserve energy for increased efficiency. 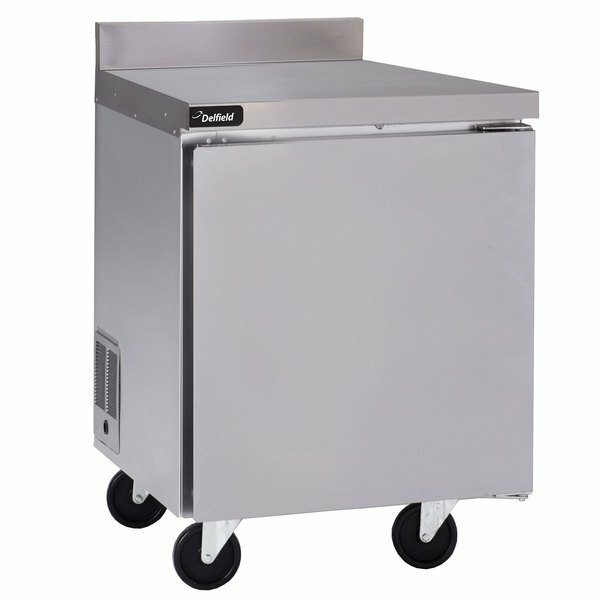 It comes with a set of 5" casters (2 front locking) so that you can easily move the unit for cleaning. This unit requires an 115V electrical connection for operation.